aksa Software Solutions Pvt. Ltd. completes its eleven years of successful operations, in the pursuit of providing quality services and extending relentless support to its clients and associates. IT infrastructure management help businesses to be more agile and flexible, addressing demands such as ramp-up or ramp-down considering the prevailing macroeconomic scenarios?" 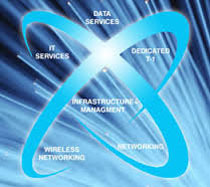 Data Center, End User Computing, Networks, Managed Services, Cloud, Business Advisory and Global System Integration helps businesses across the globe to transform their vision to reality.Our services are built on the concept of 'Standardization at the backend' to bring in operational efficiencies and drive down costs. We also help our customers to variabilize their IT costs to bring in Business Agility in the current macro-economic scenario. "The Aksa team is a very competent and professional group of specialists who have demonstrated an ability to provide excellent results. There are no limits of exposure to new technologies In Aksa Software.A very open culture and very good environment to work.